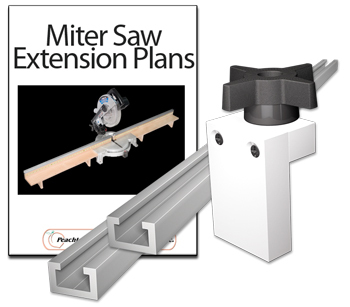 This exploded shop drawing shows how to build a miter saw fence extension to fit any popular miter / chop saw. 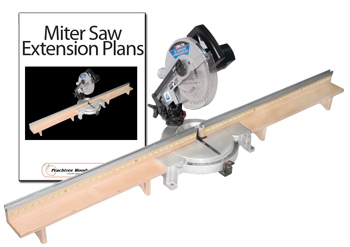 Expand on this clever fence extension to build a custom miter saw fence extension that works best for your saw and your shop. Note: Includes plans only ,HD T-Track, mite saw, measuring tape and wood not included. Build a 8’ or 16’ system, whatever fits your shop needs. This fence kit will allow you tomake accurate and repetitive cuts. With a simple turn of the knob on the stop block, (included) you can lock the block in place for specific length cuts. The track on the top of the fence will accept any standard 3/8” hex head bolt, which will allow you touse any home made jig or fixture. Cutting wood with accuracy is an important part of making sure the project turns out just right. The inaccuracy of pencil marks on a board can then be compounded by the need to follow that mark precisely with the saw blade. 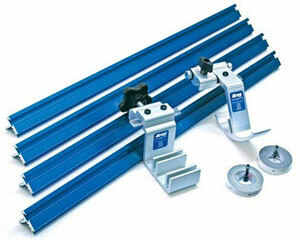 Our Precision Trak and Stop Kit is designed to take the guesswork out of cutting wood to length. This kit contains 8’ (4 – 2’ sections) of anodized aluminum trak (also available separately that can be mounted to a shop made support wing built to the height of your miter saw. A ½” self-adhesive tape is then applied to the top of the fence. Finally, slide the Flipstop and Production Stop onto the top of the trak and you have a precision cutting station that eliminates the need for a tape measure and pencil. Simply place the precision lens cursor over the board length desired, press the board against the stop, and cut away! Precise, repeatable cuts could not be any easier.